Popsicle Week is here, just in time for the last week of my birthday month! 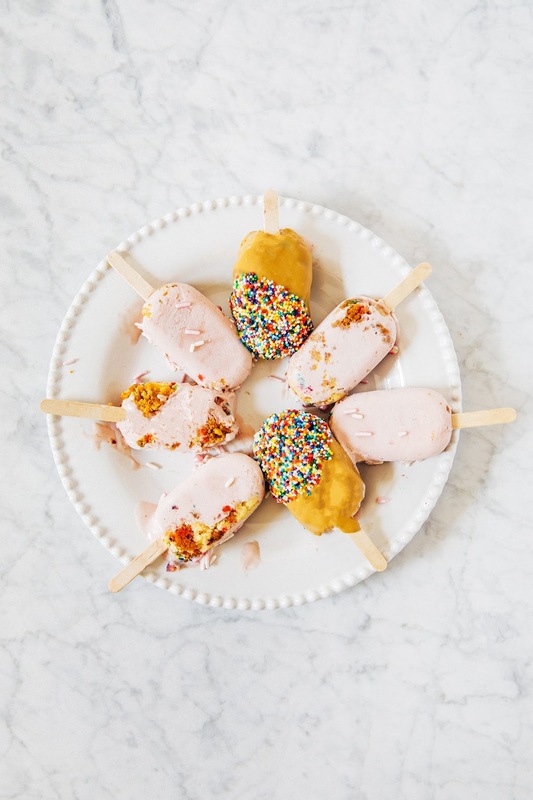 What better way to round off blondies, birthday cake, and Drake-themed cookies than with a tasty, frozen treat like these strawberry pops infused with yellow funfetti cake flavor? This is my first popsicle week ever, which is ridiculous since Billy's been hosting Popsicle Week for as long as I can remember. For some reason, I never had my life together in time to participate in the past years? To be fair, I think I was in the throes of a big move from San Francisco to New York last year and had already packed away my popsicle molds, but I don't remember what my excuses were before that. But it doesn't matter, I'm here, I'm here! I sorta screwed up again this year — because instead of using my fancy popsicle mold that I spent way too much money on, I used a mini ice cream bar mold to make these pudding pops*. I was inspired after Steph and I spent way too long time creeping on @rymondtn's Instagram account. 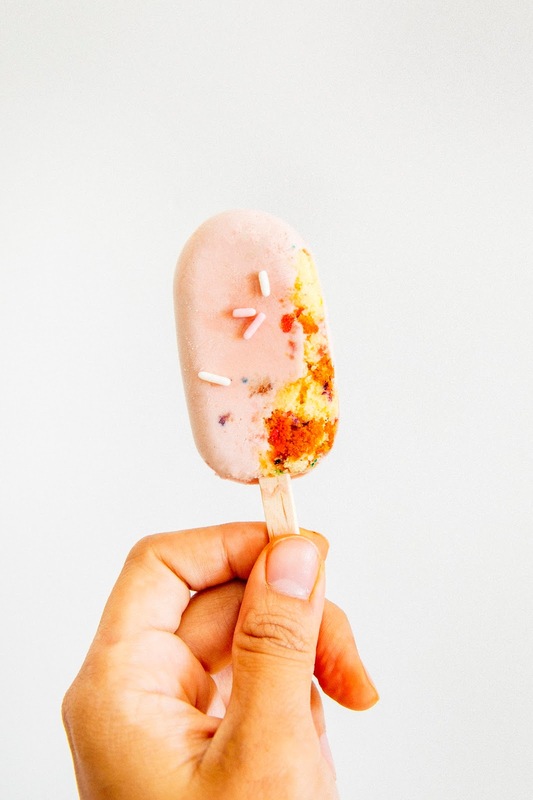 Ray is some sort of ice cream bar transfiguration wizard, I swear — he can turn ice cream bars into marbled galaxy surfaces, woodland creatures, and more. I figured that if he was successfully turning his ice cream bars into Pokemon and Japanese beckoning cats, it wouldn't be too much of a stretch for me to make some simple dipped ice cream bars, right? So here's how it went down: I managed to dip two of my bars in a bowl of melted Valrhona dulcey blonde chocolate before I gave up. It was a mess. My bars came out chunky and uneven, with chocolate layered on incredibly thick in some places and barely covering others, leaving spots of pink, strawberry pudding poking out from underneath. Whatever he was doing to get the chocolate on his bars smooth enough for a marbled galaxy effect and elaborate decorations, I certainly was not. FINE, I huffed, quickly shoving the bars back into the freezer to prevent them from further melting in the 90 degree heat of my apartment. They look better undipped anyway. That way people can see the yellow birthday cake embedded within the strawberry pudding base. Right? But Ray — if for some reason you ever find yourself on my site reading this, TEACH ME YOUR WAYS. *The rest of the SLAMM squad made some kind of pudding pop variation too! Steph made carrot cake cream cheese pudding pops, Lily made vegan banana pudding pops, Alana made matcha azuki pudding pops, and Molly made pistachio butter pudding pops. Yay!!! For the full list of popsicles, check out Billy's site and join the popsicle party. 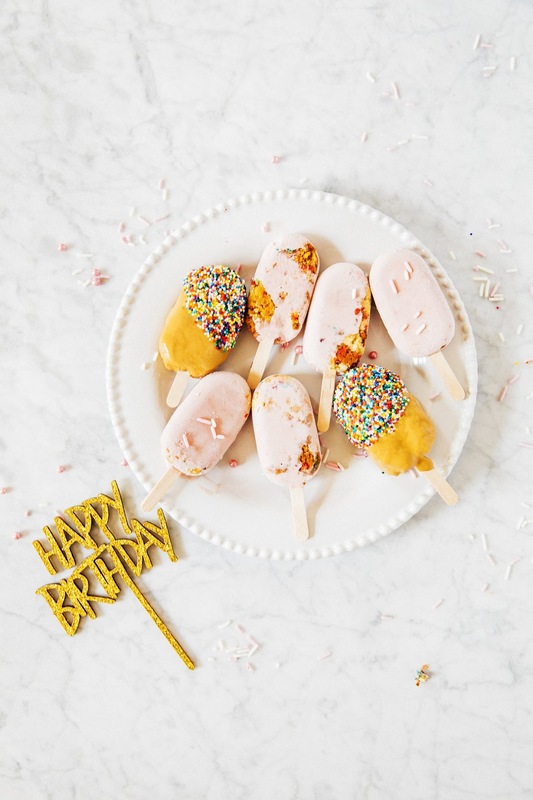 **These pops are the final recipe for #humhibirthdaymonth! 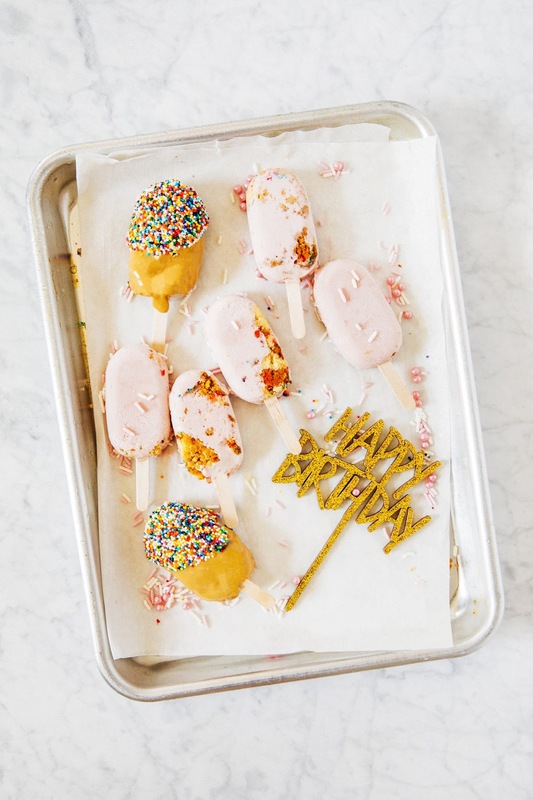 Check out the rest of the birthday month recipes: birthday cake blondies, 30th birthday cake, and pink champagne oreos. 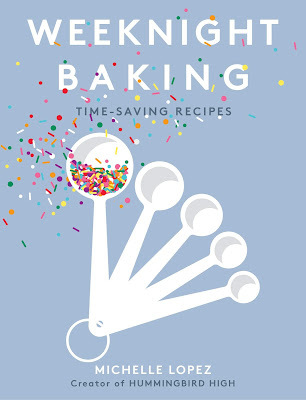 The cake recipe is adapted the funfetti recipe from my friend Christina's latest book, Sweet & Simple. Christina scales down all recipes on her blog to smaller serving sizes just meant for two, which meant that her recipe had just enough cake for the pops (okay, it actually made slightly more because I ate some of the cake on its own), The only change I made was to keep the egg yolk in the recipe (she omits it in the original) to give the cake a more yellow crumb. 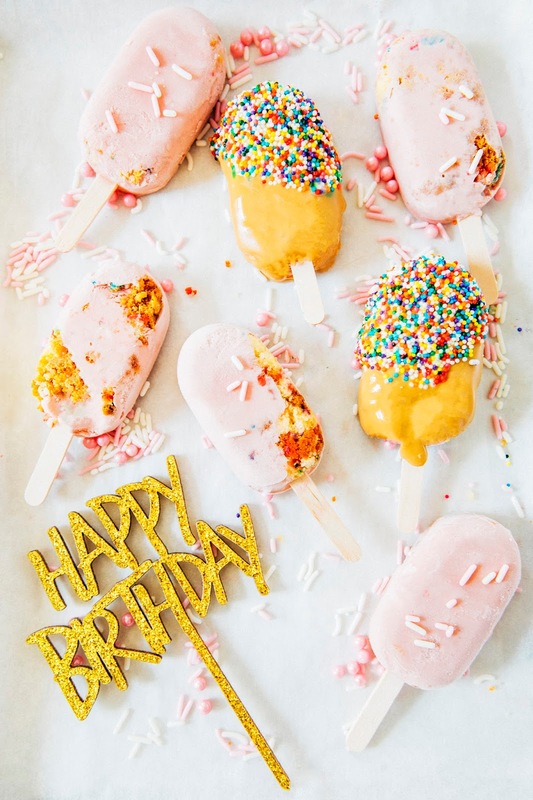 Make sure to make the cake first so you can have it ready for the pudding pops! It's incredibly, incredibly hard to find a good strawberry pudding recipe. After some failed attempts, I just decided to use this recipe adapted from Wilton Cakes. It's fine — definitely not as custardy as I would like it to be, but it doesn't really matter anyway since you end up freezing it all for the popsicles. Also, my version probably isn't as flavorful because I use fresh strawberries without the weird preservative syrup they make you use. So basically, let me know if you have a better recipe for strawberry pudding, please. Center a rack in the oven and preheat to 350 (F). Prepare a 6-inch cake pan by spraying with cooking spray and lining the bottom with parchment paper. Spray the parchment paper and set aside. In the bowl of a freestanding electric mixer fitted with a paddle attachment, beat together 1/4 cup unsalted butter and 1/3 cup plus 2 tablespoons granulated sugar on medium speed for 3 to 4 minutes until light fluffy. Add 1 teaspoon pure vanilla extract and 1 large egg and beat until combined. Add 2/3 cup all-purpose flour, 1 teaspoon baking powder, and 1/4 teaspoon kosher salt for just a few minutes to combine, before adding 1/3 cup plus 1 tablespoon whole milk all at once. Beat for 1 minute or until smooth, but do not overmix. Add 2 1/2 tablespoons sprinkles and stir until incorporated throughout the mixture. Pour the cake batter into the prepared pan and bake for 40 to 45 minutes, or until a skewer inserted into the center of the cake comes out with only a few moist crumbs. 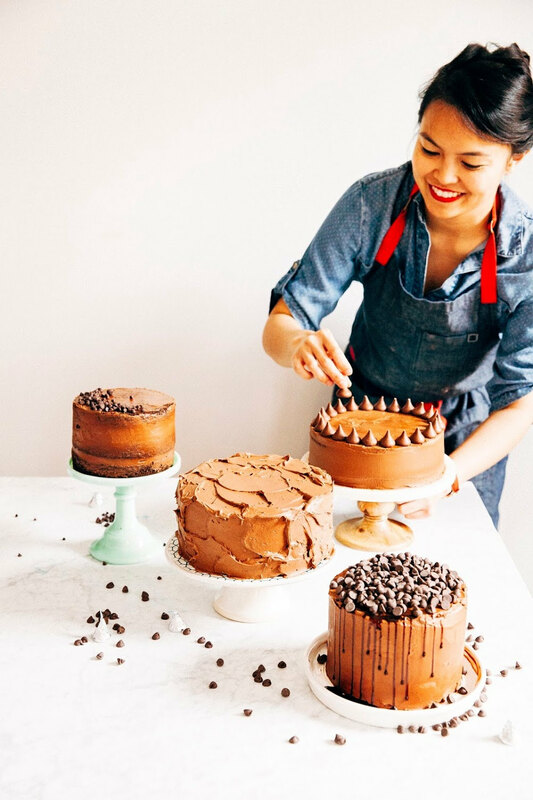 Transfer the cake to a wire rack and cool completely. In a medium, heavy-bottomed saucepan, combine 8 ounces roughly chopped strawberries, 1/2 cup granulated sugar, 1/2 cup heavy cream, 1 tablespoon cornstarch, 1/2 teaspoon pure vanilla extract, and a pinch of kosher salt. Cook over medium heat, whisking constantly to prevent the fruit from burning, about 8 to 10 minutes. At this point, the strawberries should break down, and the mixture should thicken to a point where the whisk leaves a trail. If it's still too thin or still too lumpy from the strawberries, continue cooking until thick and smooth. Remove from heat and cool to room temperature before using for the popsicles. Roughly chop the yellow cake into 1 to 2-inch pieces. Take the pieces and squeeze them together to form dense cake balls roughly the size of a grape. Transfer the cake balls to a medium bowl and pour the strawberry pudding over them, tossing once or twice — the point is not to coat the cake balls entirely with pudding, but instead to get some crumbs incorporated throughout the pudding. 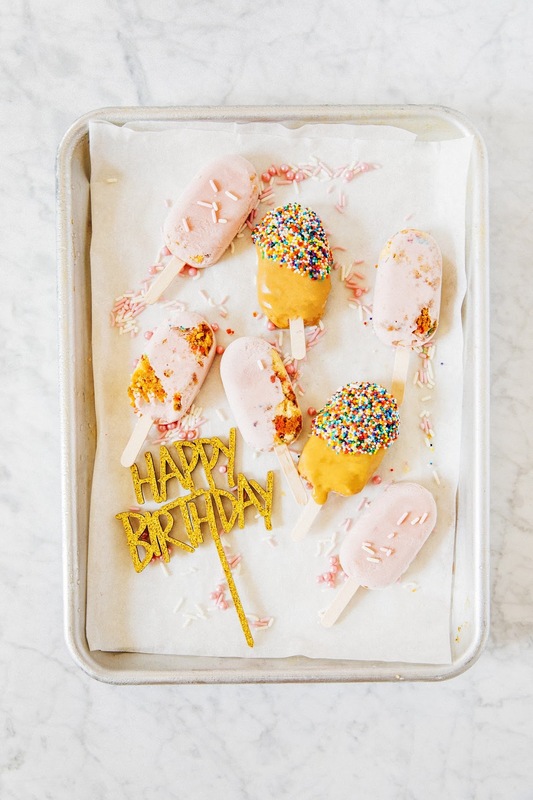 Use a spoon to transfer some of the cake balls and the pudding into popsicle molds; for more contrast, it's better to actually leave the cake balls uncoated and pressed into the outer edges of the popsicle molds. For some pops, I used a 50:50 cake/pudding ratio, for others, I used a 25:75 cake/pudding ratio. Play around with the ratios and see what you like best! Transfer to the freezer and freeze for 6 hours, preferably overnight.